In view of the severe weight restrictions imposed on the LM, and given that propellant was a major fraction of the spacecraft's weight, typically about 70 per cent, it was vital that the tanks, which were somewhat larger than they were required to be, were loaded with only as much fuel and oxidiser as would ensure a safe landing. It was equally vital that a system be in place that would allow the crew and flight controllers to monitor the remaining quantity, especially as the levels got low just when the commander was likely to be hovering, looking for a safe place to set down. 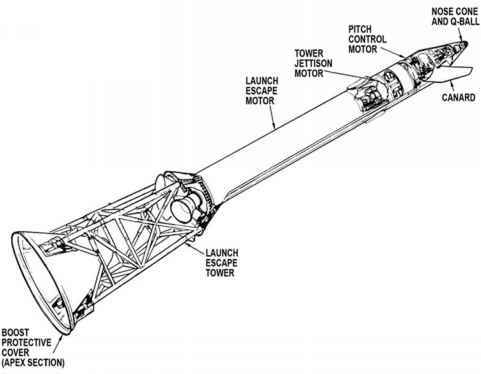 The tanks of the DPS had two independent systems for measuring propellant quantity, either of which could be monitored by a gauge in the cabin and both of which could be monitored from Earth. As the descent progressed, flight controllers closely watched how each system responded to the falling propellant levels and decided on the one that seemed to be more trustworthy and appropriate for the crew to monitor. After about 9 minutes, when P63 had delivered the LM to the high gate, typically only 2,200 metres up and 7.5 kilometres from landing, control was passed to Program 64, whose role it was to guide the LM through the approach phase to a point just above the landing site. Many aspects of the descent changed at this point. In particular, it did not continue the effort by P63 to reach a point below the surface. Before reaching high gate, the crew's windows had been facing into space, so P64 was programmed to give them a chance to see where it was taking them. It fired the RCS thrusters to pitch the spacecraft forward enough to enable the crew to view the horizon ahead - a manoeuvre called pitchover. This change in attitude with respect to the ground meant that the antenna for the landing radar had to rotate to its second position to continue to face roughly downwards. Meanwhile, P64 continually rode the engine's throttle setting to aim for a point 30 metres above and 5 metres short of where it thought the final landing site was located. As Pete Conrad waited for P64 to begin, he strained at his window to look for a familiar pattern of craters towards which he had been trained to fly. Photographs taken 2 years earlier by a Lunar Orbiter mission had shown that the Surveyor 3 unmanned spacecraft had landed within a 200-metre-diameter crater that formed the torso of a distinctive pattern of five craters known as the Snowman. Planners had decided that this would make a good target to prove the pinpoint landing capabilities of the Apollo system. ''Standing by for P64,'' he told Al Bean standing beside him. ''I'm trying to cheat and look out there. I think I see my crater.'' He was the shortest of the astronauts, and was straining against the harness restraint to see the lunar surface in the bottom corner of his triangular window. ''Pitching over,'' said Bean as the LM began to tip forward. ''That's it; there's LPD,'' said Conrad as he brought up the angle display of the landing point designator.